﻿ Shree Swaminarayan Travels - Carelessness And Ignorance. Home > Shree swaminarayan travels > Shree swaminarayan travels - Carelessness and ignorance. Shree swaminarayan travels - Carelessness and ignorance. This is Pratik Jangid, I have booked 2 sleeper ticket in Swaminarayan Travels for travelling from Ahmedabad to Adipur for my mother and father. 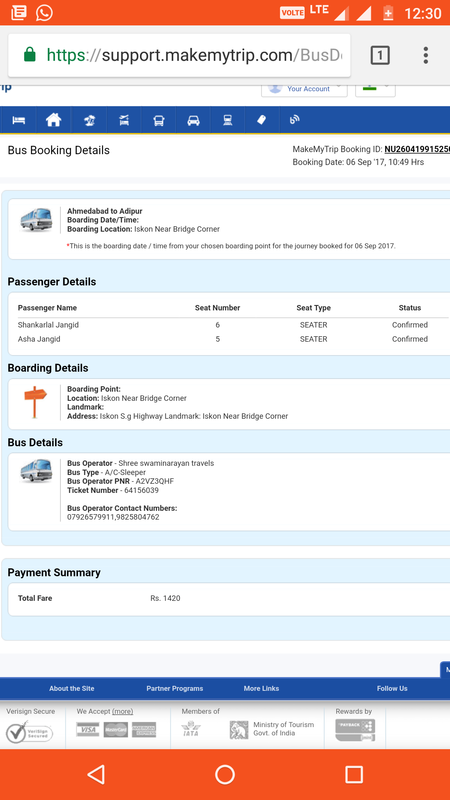 My mother is a heart patient and she has been recently treated in Ahmedabad and was going back to Adipur(home town), as she was recently treated I booked sleeper in the best class of this variant which cost me Rs1420, which is max for the bus fare from Ahmedabad to Adipur. The bus I booked was of Swaminarayan Travels and the bus is Mercedes Benz. The seat no is- ,. The bus timing was 11.50pm at the boarding point , at the last min due to some issue the original bus was not able to come and a bus of very low quality as compared to Mercedes Benz came and on to that my mother and father were forced to take a seater seat other than sleeper, also the owner of the travels are so ignorant that they didn't even intimate us about the change of bus and also they were not picking up the phone call. This behaviour will cause a lot of problem to my mother as she has been operated recently and This is the kind of response a common people get from the private organisation . This should be stopped immediately and very strict action should be taken.